The homeownership rate among young people has been declining steadily in recent years. In 2005, 43% of adults under the age of 35 owned a home. Today that rate is just 35%. There are a number of possible reasons for this shift, including the rising cost of housing in many cities. Yet, just as housing costs are not increasing at an equal pace in every part of the U.S., in many cities homeownership among young adults is not declining at all. Check out our monthly mortgage payment calculator. In fact, in 21 of the largest 200 U.S. cities, the homeownership rate for adults under the age of 35 has increased over the past decade. Despite the late-2000s housing crisis, which drove many potential buyers away from the market, millennials in these cities are buying homes at greater rates than young adults were 10 years ago. So where in the U.S. are millennials buying homes? SmartAsset’s analysis of millennial homeownership looked at U.S. Census Bureau data from 2005 and 2014. Specifically, we looked at households in which the head of the household was less than 35 years old. We calculated the percentage of those families that owned their own home in 2005 and in 2014. We then ranked the 200 largest U.S. cities on two separate measures: the overall 2014 homeownership rate for young adults and the percentage change in that rate since 2005. We averaged those two rankings, giving equal weight to the two metrics of homeownership. Finally, we calculated an overall index score that ranged from 0 to 100. The city with the best average ranking scored 100 on that index. Read the 2017 edition of our annual study. Millennials aren’t buying in big cities. Over the past decade, the homeownership rate among young adults fell in all but one of America’s 25 largest cities. In Boston, it remained unchanged at 16%. In several cities, including Portland, Denver and San Jose, it fell by more than 10%. Affordability is key. In eight of the top ten cities where the homeownership rate among young adults has increased the most in the past decade, the median home value is lower than the national median. Florida, Texas top states for millennial homeownership. These southern states both place two cities among the top ten in SmartAsset’s study. It isn’t hard to see what has been attracting millennials to this Florida city. Located along Florida’s Atlantic coastline, Port St. Lucie has warm and sunny weather year round and is right by the beach. It is also very affordable. According to Zillow, the average home value in Port St. Lucie is about $170,000. Yet prices are growing rapidly, one reason it’s also a top city for real estate agents. Those factors have all contributed to the rise in homeownership among millennials in Port St. Lucie. 58% of millennial households in the city own the home they live in, the highest rate in the U.S. That is also 2% higher than the homeownership rate among young households in Port St. Lucie a decade ago. Since 1980, the percentage of adults under the age of 34 who have never married has risen from 41.5% to 65.9%. Over that same time, the average age of first-time mothers has risen from about 23 to just over 26. In other words, millennials are waiting longer to start families than prior generations. For millennials who are planning to have kids, however, Cedar Rapids could be a good place to settle down. Cedar Rapids area schools have some of the highest graduation rates in the U.S. and the city’s housing market is relatively affordable. 45% of millennials own their home in Cedar Rapids. Find out now: Is it better to rent or buy? 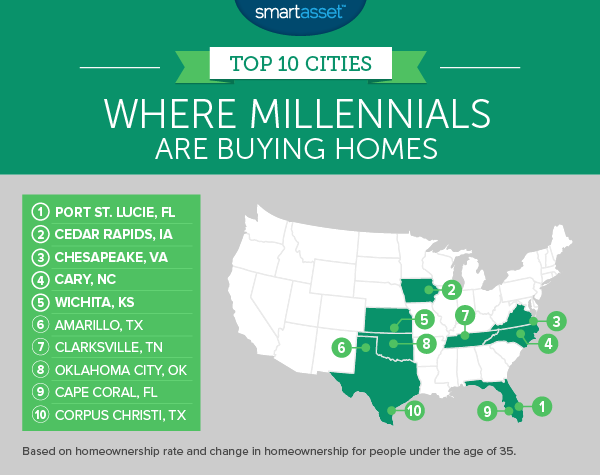 Among the largest 200 U.S. cities, Chesapeake has the fifth-highest millennial homeownership rate at 49.5%. It has also seen 1.5% growth in the homeownership rate among young adults over the past decade. If that trend continues, the homeownership rate for young people in Chesapeake will soon be over 50%. Cary is located just west of Raleigh, the capital city of North Carolina. The homeownership rate among young people in the region’s two largest cities, Raleigh and Durham, has fallen steeply over the past 10 years, by 10% and 8% respectively. In Cary, however, it has gone in the opposite direction. The city’s 3.3% rise in under-35 homeownership since 2005 is the third-largest increase of any major U.S. city. Today, some 42.1% of millennials in Cary own their home. The housing market in Wichita is an especially good choice for people who are buying a home for the first time. In particular, it rates among the top cities in the country when comparing the cost of housing to average incomes. It comes as little surprise, then, that so many millennials in Wichita are opting to own a home. The homeownership rate among adults who are under the age of 35 has increased by 4.3% over the past decade. That is the second highest increase in the U.S., behind only Huntsville, Alabama. 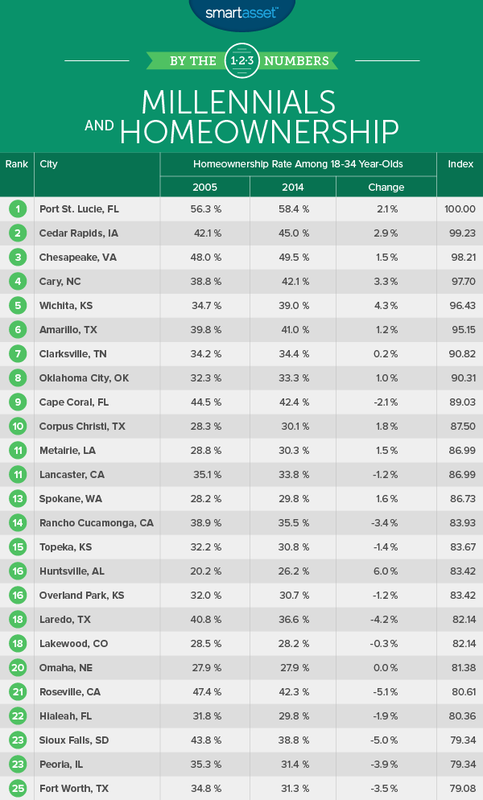 Located in the Texas Panhandle, roughly halfway between Albuquerque and Oklahoma City, Amarillo offers young homeowners some of the least expensive housing in the entire country. According to the U.S. Census Bureau, the median home value in Amarillo was just $116,300 in 2014, while the national median was $181,200. The Volunteer State’s fifth-largest city saw a slight uptick in its under-35 homeownership rate since 2005. Of the roughly 50,000 millennials who live in Clarksville, 34% own the home they live in. That makes Clarksville the only major Tennessee city with a millennial homeownership rate greater than 30%. Several others, including Nashville, were at that rate 10 years ago but have seen significant declines in homeownership among young adults since then. Between the year 2000 and 2013, the median income for young people in the United States fell by almost $4,000. In the Oklahoma City area, however, it rose slightly over that same time period (by about $70). It is one of the few U.S. cities in which millennials are doing better financially than prior generations. The rise in income may also help explain the relatively steady homeownership rate for young people in Oklahoma City, where about one third of millennials own their home. Cape Coral has been growing rapidly in recent years and millennials have not been left out of the party. 42.4% of millennials in Cape Coral own their home. While that is down 2.1% from the homeownership rate for the same age group 10 years ago, it still ranks among the highest millennial homeownership rates in the U.S. The price-to-rent ratio in Corpus Christi is among the lowest in the nation, at just 13.14. (Compare that to places like Los Angeles and New York, where it is over 30.) What that means is that buying may be better than renting for people who won’t be moving in the near-term. It also helps to explain the recent 1.8% rise in the homeownership rate among adults under the age of 35 in Corpus Christi.